Plano, IL May 28, 2013: PagePath Technologies, Inc. Honored Sorrento Mesa Printing of San Diego, California as its May 2013 Printer of the Month. Each month PagePath Technologies, developers of the award-winning Web-to-Print Solution MyOrderDesk, selects an outstanding printer in the industry that exemplifies what it means to be a graphic communications specialist. 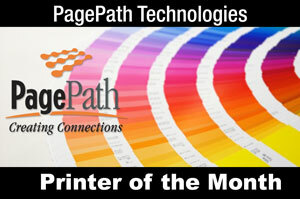 This month PagePath honors Sorrento Mesa Printing. Sorrento Mesa Printing opened in 1987 as a walk-up print and copy in San Diego, California. Located in an industrial park, the company focused on printing for companies and on corporate business-to-business ventures. Scott Cappel, President of the company, canvassed the area, knocking on doors to offer free pick-up and delivery, as well as making countless calls in order to establish their brand. PagePath’s MyOrderDesk is a Cloud Based solution that combines Web-to-Print, automated proofing, automated pricing, reordering and more. It seamlessly integrates into a printing organization’s existing website or can be used as a standalone site. MyOrderDesk is known throughout the printing industry as the leader in Web-to-Print software. More information on PagePath’s MyOrderDesk is available at http://www.PagePath.com, or by calling 866-770-7561 .